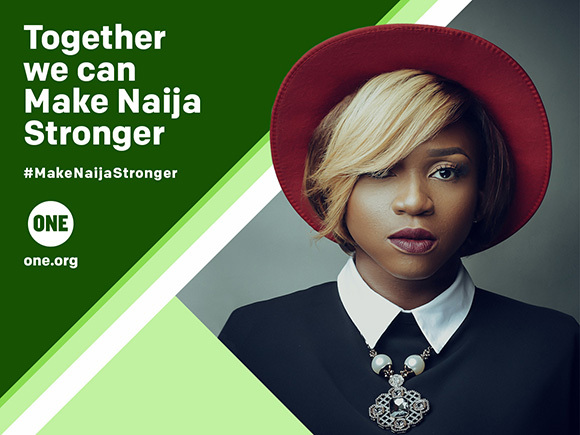 Why did you join the #MakeNaijaStronger Campaign? It is incredibly saddening and shocking that it has been 15 full years since the signing of the Abuja Declaration where all African governments agreed to spend 15% of their annual budgets on the health sector. Today in Nigeria the actual allocated percentage is only 4.3%. Millions of children and women die every day due to lack of proper health facilities. With the unfortunate story of the death of Mrs Udebu, I have come to learn about how alarming the issue is at the moment. I joined the #MakeNaijaStronger Campaign with the ONE Campaign to draw the Nigerian government’s attention to the need for drastic and immediate improvements in the health sector through increased investments. How did you feel interviewing the Mr Udebu and watching his children? It was very difficult for me to hear him tell his story. He really tried to hold himself together but it was very hard for him. When he broke down in tears, I honestly could not hold myself together. I owe my life now to the love and support I got from my mother. I have a daughter who is still very dependent on me and I honestly cannot imagine life without a mother. There are no words to replace the loss of their mother, there are also no actions from me that could bring her back. The devastating truth is that there are millions of Nigerians experiencing this same tragedy without a voice, without a listening ear. What I felt during this campaign while speaking to the Udebu’s was first a sense of hopelessness because I could do nothing to bring their mother back. Partnering with ONE on this campaign has helped me translate this hopeless feeling into the urgency to initiate the conversation and engage the government to investing more in healthcare. We can not let this continue. What do you feel the government should do to prevent such things happening again? Honour the promise made last year by President Buhari to provide additional funding to set up the Basic Health Care Provision Fund which will provide, amongst other things, services in primary health care facilities, essential drugs and respond to health emergencies and epidemics. Set clear timelines on the allocation of the 15% in the annual budget as funding for health. Ensure allocated resources benefit all women and girls particularly the poorest and the most vulnerable. Ensure transparency in the public health procurement processes by disclosing all procurement documents, signed contracts etc. Step up funding for nutrition in the 2017 budget in line with the nutrition strategy. Which part of the interview did you find most touching? I was touched the most when Mr Udebu mentioned that his wife repeatedly called him back asking him not to leave her… He didn’t have a chance to say goodbye to her. That has to be the most haunting memory he will ever have.